Enjoy a breathtaking tour of the valley by paraglider, hangglider, helicopter or airplane. Or take flight on the joyride of a lifetime on a zipline attraction. Welcome to the most diverse cycling destination in the world - from backcountry trails to bike parks & rail trails. Pristine rivers are famous for fly-fishing. Many species of fish such as Kokanee Salmon and Rocky Mountain Whitefish can be caught in the region's larger lakes. The region boasts over 25 world-class 18-hole golf resorts and a wonderful collection of 9-hole and executive courses. Adventures by helicopter can include everything from a sightseeing trip to a glacier trekking trip or an alpine picnic. Experience some of the best outings from short woodland walks to full-blown backpacking trips. 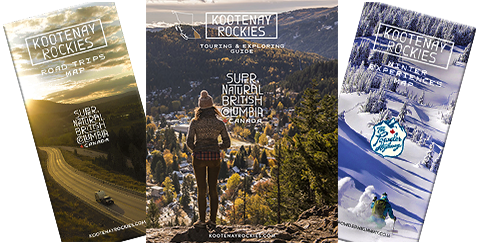 The region offers some of the best dirt biking, side by side, ATVing and snowmobiling terrain in British Columbia. Climb interesting peaks on fun or challenging rock and ice routes with a professional guide. Or, get vertical at a Via Ferrata! Communities offer a variety of specialized parks for skateboarding, rollerblading and biking. Enjoy exceptional hospitality with all-inclusive packages at the region's ranches, including Three Bars Cattle & Guest Ranch which offers a truly western experience. For the animal lovers. Experienced guides and friendly horses provide the perfect excursion. Choose your adventure: Boating, Canoeing, Kayaking, Rafting and Wetland Floats. More wonderful activities such as caving near Ainsworth Hot Springs and trail running - there's a massive inventory of trails, coaching services and many organized races & events.